Pesterer draws the viewer into a mediated new-media reality made visceral and uncertain by the persistent presence of the two swirling robots intent upon disruption. 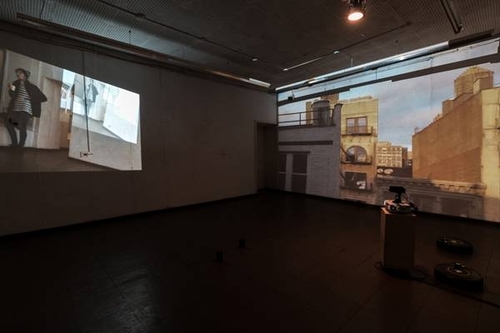 A live-stream captures the space of the installation in real time, transforming a lived experience into a projected spectacle and blurring the line between the real and the representational. Intruding further upon the tenuous relationship created between viewer, experience, and image, the Roombas are programmed to bump relentlessly into the plinth housing the projector, setting into motion a digital ripple effect that moves from the physical world to the digital world as the projection shakes — hardware, software, subject and image all become implicated in a casual prodding of the boundaries between human and non-human ecologies. Technical Specifications: Pesterer requires a camera to capture live video, a projector and screen (or appropriate space upon which to project), a plinth, and two Roombas with sufficient space to maneuver.